Paper Crafty Creations: The Paper Nest Dolls Inspiration Post:"Messy Hair Ellie"
The Paper Nest Dolls Inspiration Post:"Messy Hair Ellie"
We have changed the way we will be awarding prizes from now on, and there will only be one prize for the overall winner. The top 3 will still be named and will still have the honor of displaying the Top 3 winner badge on their blog. 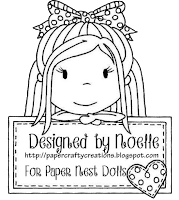 From now on, the overall winner will win a $20 gift code to the Paper Nest Dolls online store, where they can purchase rubber stamps! So, if you are the overall winner, be sure to send a message to "papernest.challenges@gmail.com"and indicate in the subject line that you are the Monthly Winner. I colored the image with my copics as usual. The designer paper is from American Crafts Dear Lizzy "Daydreamer" & "Serendipity" collections. The doily is by Doodlebug Design. The paper flowers are made by Wild Orchid Crafts. The trim and berries are from Live & Love Crafts. Thank you for stopping by! I hope to see some of your beautiful creations in this month's challenge. 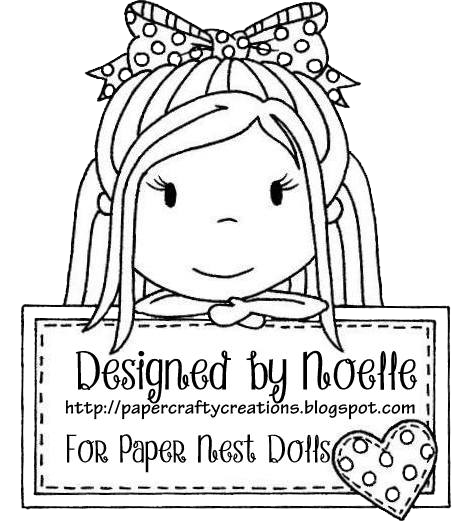 You can find all the details on The Paper Nest Dolls Challenge Blog! Feel free to leave some comments on my project if you like. Have a great day! Little Blue Button Crafty Monday: "Easter Crew"